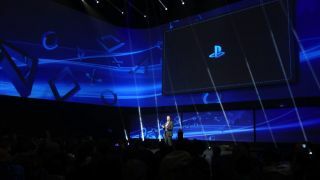 It wasn't a big surprise that Sony announced PlayStation 4 at its press conference today, but the company's laser focus on showing the games that the PS4 hardware will be capable of running did illicit a mostly positive reaction from the audience. "PS4 seems like a system for core gamers," said freelance writer Matt Cabral, who was at the New York City event. "What struck me about it the most was that the announcement was so focused on the games. A lot of the other console makers are always talking about social interactivity, which obviously PS4 is all about, but it didn't really seem like the big story today." Cabral cited Watch Dogs and David Cage's graphics-focused demo of an old man were his standouts of the of the two-hour-long press conference. "While this wasn't really a game, when David Cage put that old man demo up there, it made my jaw drop. I'm kind of a Quantic Dream geek and a fan of anything that David Cage does." This striking demo also came as a relief to MSNBC game editor Todd Kenreck, who said that "there were no real expectations, just worries." "I was worried that we weren't going to see any of the games other than games we've already seen. Like 'Haha, David Cage's Beyond is actually a PS4 game and we've just been tricking you this entire time. We're just going to show you that trailer again.'" Kenreck felt that Sony's "drop the mic moment" was during the Killzone: Shadow Fall demo, when the company unveiled the PS4 controller's widely-rumored "share" button. "There's something about that moment where they show you 15 minutes of a new Killzone, and press a button and it shares it to your friends." "We've never had that tech before because you've had to be recording ahead of time. When I review video games, I'm recording all of the time." Kenreck said that he can see using this PS4 recording feature outside of his day job, too. "If I was at home playing a video game like Killzone and thought 'I can't believe I just killed that boss' or 'I just had this epic battle' especially in multiplayer, all I have to do is hit that button, and that is exciting." He felt that Sony missed an opportunity to show PS4's recording capability by sharing a more context-appropriate multiplayer video with the internet. Then again, the company may be waiting until E3 2013 to share more about its new sharing button.